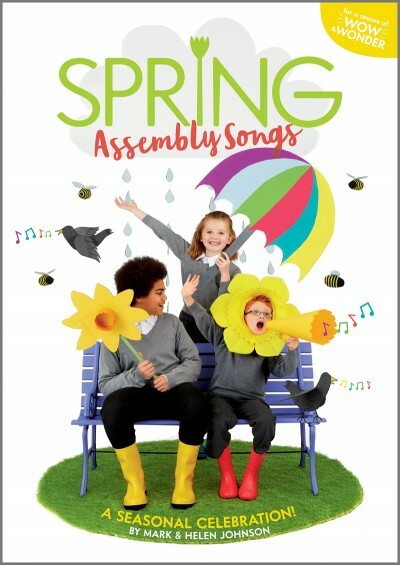 With 13 catchy assembly songs and accompanying assembly plans for celebrating springtime and Easter, Spring Assembly Songs is full of new life, bursting colours, freshness and vitality, with heaps of potential for happy springtime singing. Available with Words on Screen™ v2. Click here to watch a Words on Screen™ compilation video! Our Teacher's Choice Bonus Song chosen by you: Wake Up! Available to download! Welcome to the first in a brand new series of seasonal assembly songs by Mark and Helen Johnson – the most popular primary school assembly songwriters of our time. Highly anticipated, and building on the success of the much-loved Songs for EVERY... series, this rich collection goes way beyond all expectations. These 13 catchy, lively and inspiring songs will have a very positive impact on schools everywhere, and are sure to put a spring in your step as you sing through the season. It's an indispensable addition to any school's song library. 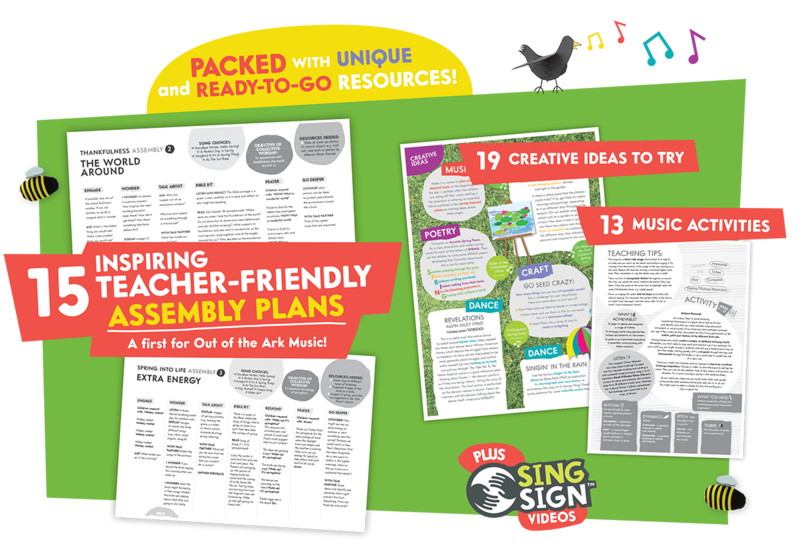 A first for Out of the Ark Music, we've provided 15 fabulous assembly plans that you can pick up and easily run with. Designed to help you deliver Collective Worship with ease, each assembly is completely accessible and teacher-friendly, and can be used with reference to a number of different songs from the collection. We've also included our invaluable music activity pages – one for each song. These help to build upon and release all the musical potential and possibilities contained within each song. Additionally our creative cross-curricular pages will excite and inspire those creative juices. This songbook and accompanying resources will tick all your assembly boxes, create confidence and inspire everyone! Video:Includes a craft video for Songbird and a dance video for We're Making Pancakes. Signing Videos:Includes 4 signing videos for Sing Yourself A Happy Song, As The Sun Rises, Goodbye Winter, Hello Spring! and Wake Up! Included with this option is a Words on Screen™ Single User Licence, allowing the Words on Screen™ CD ROM to be installed on ONE computer only. 13 catchy songs - 12 brand new songs and a refreshed-for-2019 version of The Seed Song. Teacher's Choice FREE song Wake Up! 4 Signing Videos for the songs Sing Yourself A Happy Song, As The Sun Rises, Goodbye Winter, Hello Spring! and Wake Up! Dance Video for the song We're Making Pancakes and Wake Up! Your purchase includes a Words on Screen™ v2 eSongbook to stream or download via your online account. Instantly access Words on Screen™, PDFs & MP3s online. Your purchase also includes Song Activities and Assembly Plans, Teacher's Choice Bonus Song, 4 Signing Videos, plus Dance and Craft Video links. Streaming is free for the first 12 months; after that a current Annual Digital Site Licence will be required to be able to continue streaming. Includes Song Activities and Assembly Plans. Purchase the Standard Pack online and receive the Teacher's Choice Bonus Song as a Words on Screen™ single song to stream or download via your online account. Not purchasing online? See page 6 of your songbook after purchase on how to access your Teacher's Choice Bonus Song. Full of life, energy and hope!